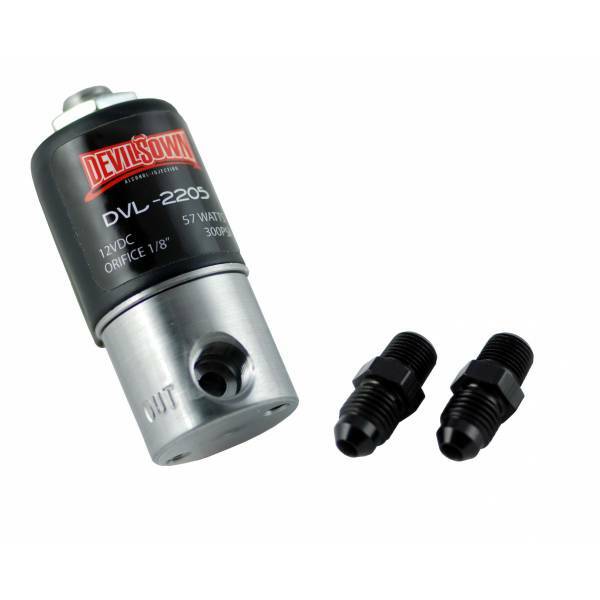 DevilsOwn Injection's solenoid prevents siphoning under vacuum or if your tank is mounted higher than the nozzle. Heavy Duty Quality: This unit is made from durable steel uses heavy 14 gauge wire to help withstand a healthy beating. The internal coil is encapsulated in epoxy for moisture protection and a rubber o-ring helps shield the unit from debris. Application: Don't compromise, expect the best. These solenoids prevent siphoning under vacuum or if your tank is mounted higher than the nozzle. They maintain 300 PSI rating while having a .125 orifice, unlike other solenoids that either have a smaller orifice to gain a high pressure ratting or a low 150 PSI rating to get the .125 size orifice. DevilsOwn's solenoid provides a positive stop for your water injection kit. This solenoid is designed to be used with methanol in a water-methanol injection system and can flow 28gph of nozzle. 15-20 seconds of continuous use,only.